Required to support dynamic Android Q scoped storage selected folders. Poweramp now keeps playlist entries even if Music Folders are changed/unchecked, Scoped Storage root changed, storage removed, etc. visualization presets now can be unliked Press preset thumb until unliked or just long press it new Visualization / Hide Unliked Presets option changed the way sub-Albums are shuffled via Shuffle button in the header The target category Albums are played first. Poweramp v3 (ALPHA-3 test builds 703 / 704) for standard (ARM-based) Android devices. 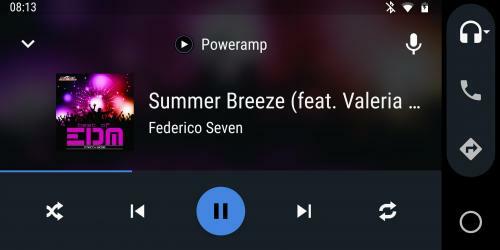 Poweramp 2.0.10 (build 588) for standard (ARM-based) Android devices. 588: album art downloading update 587: rebuilt with previous Android Build Tools version to fix UI language selection (Android 4.4-) 586: fixed embed covers @ Samsung S7/E 586: added link to v3.0 test build (Settings, Android4.1+/ARM-only 585: fixed album art downloading 584: fixed couple of minor issues @ Android 6.0 583: fixed tag editing on SD card @ Android 6.0 583: fixed issue which prevented some skins from loading on Sony devices @ Android 5.0+ 582: fixed issue with seekbar @ Android 6 If for any reason you have problems when you install the latest build, you can re-download recent older versions from one of the other links. Poweramp v3 (ALPHA2 test build 702) for standard (ARM-based) Android devices. This version is focused on Hi-Res output and Album Artist support. 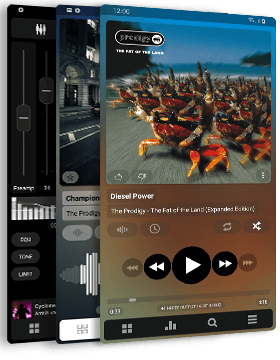 Poweramp v3 (ALPHA2 test build 701) for standard (ARM-based) Android devices. - Album Artist tag support. Albums are grouped based on Album Artist tag, where available. Album Artists category added as well (hidden by default). Poweramp v3 (ALPHA test build 700) for standard (ARM-based) Android devices. 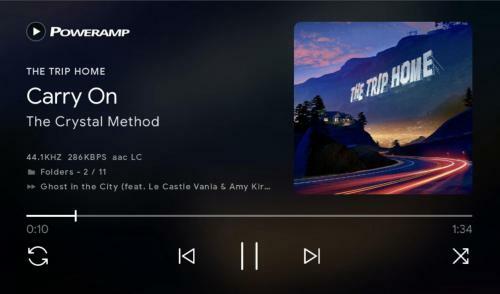 Poweramp 2.0.10 (build 585) for standard (ARM-based) Android devices. 585: fixed album art downloading 584: fixed couple of minor issues @ Android 6.0 583: fixed tag editing on SD card @ Android 6.0 583: fixed issue which prevented some skins from loading on Sony devices @ Android 5.0+ 582: fixed issue with seekbar @ Android 6 581: enabled skinned Menu options on Android 5/M-preview 581: Greek win-1259/iso-8859-7 tag encoding option 581: fixed album art selection from gallery If for any reason you have problems when you install the latest build, you can re-download recent older versions from one of the other links.